There are some selfish reasons to leave the electricity grid, and a very good altruistic reason to stay connected. Recently there has been much speculation about the option of going off-grid; that is, installing (usually) solar PV power and batteries and disconnecting from the electricity supply network, the grid. This article will not look at the economics. It will look into what the outcome is going to be to you, should you go off-grid and it will look into what effect that will have on the nation’s greenhouse gas emissions. The article is necessarily speculative. It is airing ideas more than providing facts and it applies to a country such as Australia, where most of the electricity is generated by burning fossil fuels. Why leave the power grid? People are reducing their power consumption while the cost of maintaining the grid remains the same. So the income received by the power companies goes down and they increase their charges to compensate. As the price goes up, people reduce their consumption more; the power companies respond by jacking their prices up again. As the price of power goes up and the price of generating and storing electricity at home falls some people say enough is enough and decide to go off-grid. So consumption from the grid falls even more. It continues… This has been called the death spiral of the power grid. What will it mean to you, personally? If you go off-grid you will avoid the rising price of electricity and save the connection fee. Apart from the cost of going off-grid – which is high, but coming down all the time – the main disadvantage is that if you do not use exactly as much electricity as you generate (not necessarily at the time you generate it) the remainder will go to waste. You will not be able to sell it and no one else will be able to use it. If it did go into the grid it would displace an equal amount of ‘dirty’ fossil fuel-generated electricity. How would you feel about it if a decision you made for selfish reasons adversely affected the nation’s greenhouse gas production rates? An important point to note is that your solar panels will generate about twice as much power in December as they will in June, but your power consumption pattern might be quite different. Most people who go off-grid will be relying on solar PV. It is likely that they will want more electricity than they are generating in the winter (short, dull, days) and they will probably generate far more than they need in summer (long, sunny days). To a small extent this can be counteracted by placing the solar panels at a steep angle; this means less electricity is generated in summer and in total for the whole year, but when the winter’s sun does shine the panels are facing it and winter generation is maximised. What effect will the move off-grid have on the nation’s greenhouse emissions? Those who go off-grid will no longer be able to feed renewable electricity into the grid; this electricity, had it gone into the grid, would have displaced some fossil-fuel generated electricity. They will probably have to use a fossil-fuel (petrol or diesel) powered generator to give them power when their PV (or wind or hydro) is not providing enough. Both effects will increase the nation’s greenhouse emissions compared to what they would have been if these people stayed on-grid. If you care about climate change and ocean acidification, don’t go off-grid. You can install solar PV (or a wind generator) and batteries and have them as a backup should the grid fail without disconnecting from the grid. It’s the best of both worlds; independence and your excess power displaces dirty fossil fuel generated power. Ask a reputable solar power installer about it. 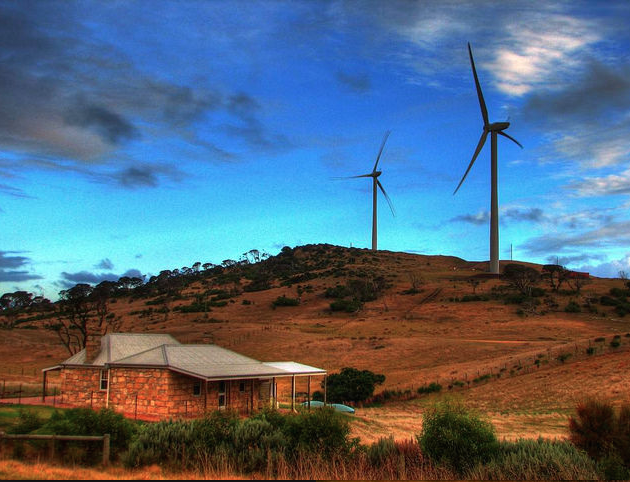 There are alternatives to the unethical big three: Energy Australia, AGL and Origin. This article was adapted from a Net page: ramblingsdc.net/OffGrid. See that for more detail. Hi David and thanks for a thought provoking article. I suspect that while it suits a lot of solar-buyers to believe they are reducing carbon emissions, the main reason is that their electricity bills have just escalated just too much and too rapidly. A popular expression these days is that the utilities have gold-plated their infrastructure programs because their investments are linked to the price of electricity. Perhaps there is some merit in that argument, but the electricity market is convoluted and hard for most folks to understand. That breeds distrust and strengthens resolve to get off the grid, or at least minimise power draw from the grid. It does not help that many State governments want to off-load their electricity infrastructure – historically privatisation has been painful – and no matter how sound the case, most people I know just don’t believe consumers will be the beneficiaries. Some recall when we had seven free enterprise banks and rue that we now have far less. David I agree with your general thrust that as consumers walk away from the grid the providers will suffer, contract and raise their prices. I think that gives anyone who can afford it sufficient rationale to go their own way. From an individual position, I suspect that the “Tragedy of the Commons will apply. What to do? I think there is a solution but it would require some a radical overhaul of the current paradigm, a dismantling of an empire or two and an alliance between the electricity providers and the consumers. Difficult for sure but with sufficient will, especially political will we could get a sensible and equitable solution. There might be a small snag. If battery storage improves, it would bring serious problems to the utilities. Batteries have two main problems: their cost and their relatively short life of around eight years for lea-acid (terms and conditions apply to that statistic). But if you could get batteries with a life of around 20 years for a cost of $4000 then an off-grid house is quite viable – at least in theory. But if that does happen (and it is likely), then the utilities will need to find a new role. I agree with most of what you say gmhendo. My main concern is that the excess (solar or wind or micro-hydro) power of those who leave the grid will not be able to be consumed by others and so they will be drawing mostly fossil fuelled power instead. And then how many of these people will also run a petrol or diesel generator to top up their batteries when, had they remained on the grid, could have used Green Power? It is very difficult to try to forecast what will happen to the grid in the future. The ‘death spiral’ argument has quite a bit to recommend it. We hear a huge amount about how battery development will be the big game changer, I’ll wait and see on that one. Great timing David. On the day you lodged this post Elon Musk (Tesla) announced a range of batteries for domestic and industrial use. They are apparently going to be available in OZ as from next year! Going a little further with your thinking, the economic reality does come in to the question of going off grid. There was a time when our electricity assets were there to provide affordable and reliable electricity to consumers. Since the adoption of the neo-liberal version of capitalism, consumers are there to provide reliable and adequate profits to the owners of the assets. I saw this coming and abandoned the grid more than twenty years ago. Going off grid has the potential to be very expensive – due mainly to battery costs so Tesla have a real role here. In my case I designed the house to be compliant with the second law of thermodynamics so that no energy was needed for heating or cooling (there is no need for a heater at all). So I need only about 5kwh a day to have a comfortable lifestyle and this can be met with a modest setup. The other issue is carbon emissions and the political dishonesty that goes with it. No Australian government is ever going to tackle global warming because of the impact on exports of fossil fuels. A range of governments since 1997 have talked about the problem, but talk is cheap. Agreed ruraljack. When what was a government service is privatized the new owner is obliged to get the ‘best’ possible result for their shareholders. Unfortunately ‘best’ does not take into account environmental outcomes.